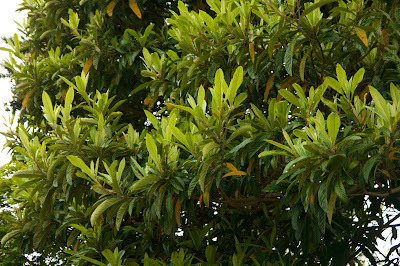 Since I took the plunge a while back and bought a Loquat at Cistus Nursery I’ve been noticing them all around town. Too many to be a fluke, I guess they really are hardy here. This one is outside the Delta Café in Sellwood (a neighborhood in SE Portland). There is a pair in the front courtyard at the Kennedy School Restaurant in NE Portland. 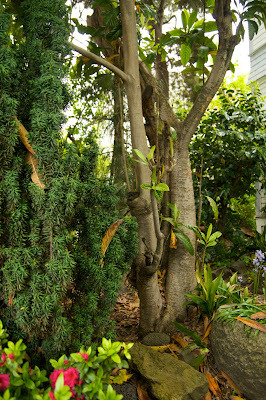 And one in the garden of a neighbor of mine… The one outside the Chinese Garden is large. There is one at Joy Creek Nursery in their display garden which I almost walked right by without noticing. It shows a few signs of not being thrilled with last winter’s treatment (it gets colder out in Scappoose than in Portland proper). And this one at Marbott’s Nursery in NE Portland could be yours! This last one comes via Scott of Rhone Street Gardens. 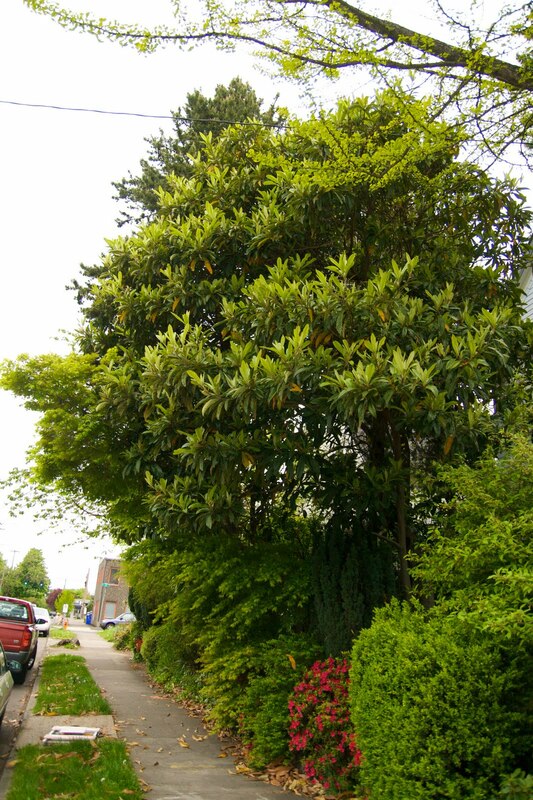 He’d mentioned that there was a huge Loquat growing near his home in SE Portland (I think there is a house back there?). I asked him to send me a picture. He obliged with a whole set! . Look at the trunk! There’s a story in there. I love the color of the new leaves against the old. As for my Loquat, it’s in limbo. You see it’s destined to be planted against the back of our house, which is currently in the process of being prepped for painting. So it waits. But this reminds me that I should mention my “new projects”: I’ll be replanting/reworking both the “back of the house” planting bed and the “next to the garage” bed. Such is the case when you hire someone to paint your house, in May. Yes we wimped out, our DIY project morphed into a “we pay you to do it” project. Many things were dug…to give the painter space to work. Don’t get me wrong…he hasn’t got it easy but I removed big things like the 3 ft tall Solomon’s seal that was hugging the garage. And the Syneilesis which had no means to support itself when the tarps were laid down. I couldn’t bear to see this plant trampled. These tender shoots looked deader than dead for a couple of days after I dug them. But they’ve responded to water and are giving me cautious hope that they’ll make it. Luckily I had recently read that the Veratrum would not respond well to digging. So I used a tomato cage to protect it (because lord knows it will be awhile before I’m planting tomatoes!) and to secure the fronds of a nearly fern. Lots of things are in a holding pattern. I’m not sure if this is more painful for me, or for them. And naturally now that I’ve started to dig I’m now questioning other things like the Hydrangea and the Hakonechloa? Should they stay or go? If this was a housing remodel project I might be accused of “scope creep.” All I can do is hope the painter moves fast, and doesn’t damage things left in place. I'll just focus on getting to plant the Loquat and hope that everything settles soon. Are those the fruiting or ornamental Loquats? They look good in your climate. I'm still lusting for a loquat of my very own, but I don't think it will happen this year. I can only make room for one by removing an existing big shrub. Scott and I first saw that loquat while on our way to meet you for the field trip. It's on 11th (or 12th) just a bit North of Powell, I think. I bet it smelled great when it was in flower earlier this year. I wonder if you'll get fruit if part of your plant grows under your eaves? i love loquats, too. the foliage is great in flower arrangements, too. They grow like weeds or us here in Charleston. The fruit is ripening and beautiful creamy-orange. They do make a mess on the bottoms of your shoe, so watch your step! Love the local skinny on loquats. It's such a handsome tree, it's great to know it really is hardy - even in Scappose. And good for you, deciding to pay to have the house painted. Summer's too short to spend most of it on a big project like that and it will get done so much faster. Besides, you make me feel better because we also are paying to have so much work done by others (including exterior paint) that we would formerly have done ourselves. I wish you blue skies and dry weather for a quick and gorgeous result! And maybe I'm off to Marbott's for that loquat - who would have thunk it would still be there?! This is one of my favorite small trees. They are hardy here as well, and there is nothing like the fragrance of their flowers. However, our winters must start too soon here for the fruit to ever set. If we have any leftover at work in the fall we move them to an unheated hoop house for protection, and these always produce fruit, but those planted in the garden go without. It's a shame since the fruit is delicious. BTW, my Tetrapanax did not come completely out this spring. It sprouted from below the tip and is coming out of the sides. Oh well, I should be thankful for two years of near perfect growth. I second what MulchMaid says...so glad you aren't going to spend your summer painting...hope it turns out just like you envision it! It's good to have somebody else do something you've been assuming you'd do. Actually it's great. I love Loquats too; the leaves are so beautiful. I'm going to have one in Florida but not till we're more there more regularly; I think the six month drought would do it in! What area of Florida? I'd keep it watered for you, while you're gone, if you're near S.W. Florida... Hit me at...---> thelylefile@hotmail.com I currently grow, Jujube, Ilama, Canistel, Chico Sapote, Grumichama, Pitomba, Carambola and Persimmons, at my condo. Will probably add a Barbados, etc in the uture. I love my loquat! But mine appears to have been damaged in the late freeze (I garden in NE Portland). Part of it looks like the one in your photo taken at Joy Creek. This time of the year mine drops a lot of leaves as it pulls nitrogen from them to use for the new growth. I don't think my specimen is the healthiest out there. When I bought it, I was naive enough to believe the person when they said the sooty mold could be washed off...it still has it 4 years later. All of that said, I LOVE my Eriobotrya! Hoover, uhm...well....you got me. I don't know! I think that even if they should/could produce fruit here they probably get zapped by the cold before that's possible. You know the painter is great...I really am happy with the care he is showing them. One of the other guys whom we got a bid from warned me "we'll be careful but you know some damage is gonna happen"...this as he's standing on a plant. Ryan, unfortunately like many homes of our era in Portland our house doesn't really have eaves. It's odd but on that side of the house the roof only extends far enough out for the gutter to hold on to. I don't like it! Hopefully just being in the protected area next to the house will help. Dirty Girl, now that is a new dream of mine! To have a big and healthy enough Loquat that I need to trim it and have foliage for a vase! compost, someday I hope to visit Charleston. It really must be a gardeners dream!!! MulchMaid, really!? Yay! I hope you'll let us know if you do (buy it). You hit upon exactly why we decided to go this route. We wanted it done sooner than we could have completed it, and besides the hard working husband deserves some weekend R&R not more work! Les, I don't think I've ever seen them in flower. Here's hoping I will. And I am sorry to hear about your Tetrapanax. Yours even bloomed last year right? Denise, it seems like such a luxury! Scott, oh yes...I can't wait! Dingy white be gone! Right now we are in the trashy phase. All scraped and waiting to be primed. UGLY! Chris, yes 6 months does sound a little tough. Lauren, funny I almost emailed you and asked if I could come take a picture of your Loquat for my little inventory! Yours is gorgeous...and I have to say I am concerned that yours experienced a winter set back. It is in such a cozy little spot. And thank you for sharing your sooty mold story...it's good know even the knowledgeable have their moments! Oh, Loree...seems to me the last time there were workers at your place, you wound up with your leg in a cast. Look out! Thanks for the loquat love. Yes, that loquat on SE 12th, north of Clinton, is just one of many interesting plants at that location. I first heard about this amazing horticultural hot spot from Sean Hogan about 15 years ago. At least back then, it was a Buddhist temple or meeting house. ricki, I was chatting with the painter the other day and found myself telling him that story. I wonder if it scared him? kate, yes! That is the one Sean was talking about then. I could have sworn he said it was on Morrison...I looked and looked but there's not much to see at that intersection. I purchased a Loquat at the NWFGS about 5 years ago. The vendor (I've forgotten who it was) promised me it was really, really cold hardly. And it certainly has been. But it does get some frost burn on the leaves which leaves it looking pretty unsightly. Anyhow, love the pics. And it was great to see all the different sizes. I can't let mine as big as some of the monsters in your pics!